My two new additions have only been in the US for a few years. They are still experiencing some "firsts." Yesterday, it was crane machines. "Sister, please can I borrow a dollar? I'll pay you back at home. I want you to do it for me and win me something." Money goes in. Crane goes over. Does its thing. Nothing. "Well, I don't have to pay you a dollar now." 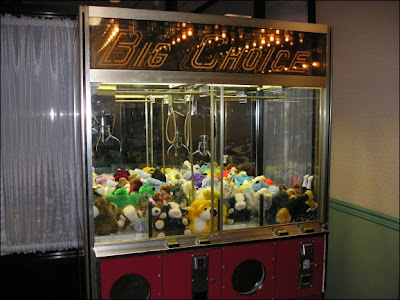 Gentle explanation about taking a "gamble" on crane machines. All the way to the car: "That's not fair. They cheated. Tell the people at the store." Gentle explanation about how they tempt people to play so they can make more money. On the way home: "Mom, if a policeman played that game and didn't get anything, could he arrest the people?" Gentle explanation about what exactly a "disclaimer" is and why it is understood that you don't always win something. I so remember the first time my son learned the 'Crane Machine Life Lesson'. It was a sad day for him! Tell him I'm an adult and I still wish someone could get arrested when I don't win the cute frog just sitting there staring at me. It's not fair! Hi there!!! Great blog!!! !I will be back for more for sure!!! Thanks for participating in this week's Carnival of Family Life hosted by Riley at All Rileyed Up! Be sure to drop by and check out the other wonderful submissions included in this week's Carnival!